Receive a FREE Shop Vac Foam Sleeve with your purchase of the McKee's 37 Wet/Dry Auto Detailing Vacuum! Every detailer needs a good vacuum. This is it! The McKee's 37 8 Gallon 2.5 Peak HP Wet/Dry Auto Detailing Vacuum provides powerful suction to clean up car interiors, garages, and workshops. Clean up wet spills and dry soil from virtually any surface. The McKee's 37 8 Gallon 2.5 Peak HP Wet/Dry Garage Vac includes a variety of nozzles plus a generous 35 foot cord so you can reach every inch of your garage. The McKee's 37 8 Gallon 2.5 Peak HP Wet/Dry Auto Detailing Vacuum is made for detailing pros and garage fanatics. This vacuum makes it easy to keep your vehicles and your garage tidy with a multi-surface claw tool, a round brush for dashboards and floor mats, and a 16 inch crevice tool to reach under seats. The 12 ft. Lock-On, crush-resistant flexible hose gives you extra reach for cleaning deep trunks. This handy Shop Vac features 90 inches of sealed pressure, or lift. Sealed pressure is the measure of how far a vacuum motor can lift a column of water up a glass tube. At 90 inches, the McKee's 37 8 Gallon 2.5 Peak HP Wet/Dry Garage Vac offers plenty of power to clean up dirty garages, vehicles, boats, and RVs. This vacuum is ultra quiet. That's a great feature if you work alongside other detailers or if you are detailing in a residential neighborhood. Your neighbors will thank you! The Lock-On hose can be removed and coiled up when not in use. The cord and accessories store onboard the vacuum. Wheels allow easy maneuverability while the tank drain means you never have to lift the vacuum to empty it of liquid. The McKee's 37 8 Gallon 2.5 Peak HP Wet/Dry Auto Detailing Vacuum belongs in every detailer's garage. Ultra Web® Cartridge provides 5-times the filtration performance as the standard filter combined with a 2-ply Collection Bag to provide better filtration performance. Had it about a month now and have been impressed with it. Plenty of hose and the long power cord make it nice to not have to keep moving the vacuum around every time i change doors. Could use some larger caster wheels for rolling over cracks in concrete or debris. Perfect for daily use, we use a similar two stage vac that is eight years old with almost daily hard use. If it is the same motor and lasts four years I will be very happy. Great suction for the size and light weight. I love everything about this vacuum except the hose. At first I was very pleased because the hose was very long. Now I have had this vacuum for about 2 years and the hose is half of it's original length. The hose keeps cracking and I have to cut off the part up to the crack and put the fittings back on the fresh-cut end. I bought this vac for my auto detailing shop. The employees hated it because the attachments were to big to use in tight spaces in cars. They especially complained about the wand being to long and too big to use in small cars. I then purchased a Shop-vac 906-87-19 Universal Tool Adapter so the smaller tools from out 5 gallon Shop vacs could be used. This pacified them somewhat but I notice they still prefer the smaller wheel-less 5 gallon vacs to work on a car. I, however have used the customized detail vac and like the long hose, long cord, wheels, switch up front and great power. It amazes me that a 2.5 hp vac has the same or better suction than the 5.5 5 gallon ones. Must have something to do with the 2 stage motor. But I don't like the stiffness of the long hose, it's like trying to wrestle an alligator. And I agree with my employees that the wand is to long and large. Maybe if it were flexible it would work better. ConsLong hose not flexible enough (too stiff) Attachments ok for large SUV's but not small cars Should come with a Shop-vac 906-87-19 Universal Tool Adapter so smaller tools could be used out of the box The free gift is basically worthless. When I use as wet vac I take filter off and it works fine. I would recommend this to a friend after informing them of the machines short comings. This is a fantastic vacuum kit. 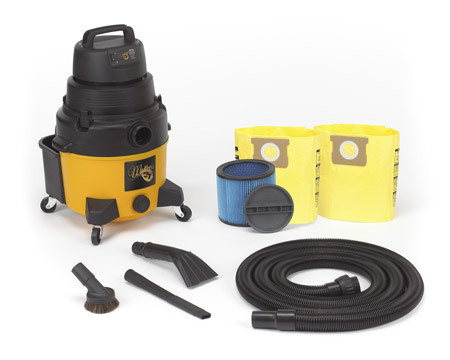 It includes everything you need from filters, bags, high quality hose and connections and accessories that are very purpose built and included. There are no "fluff" or junk accessory attachments included in this deal just for advertising purposes (like most other "car detailing" vacuum kits). It includes just the essentials needed for automobile detailing. This is a hopped up and modified Shop Vac. Suction power is remarkable. The Metro-Vac is a toy in comparison and I mean that. The attachments included are professional style. Similar to the ones you see at a car wash. The power cord is huge. 35'. rarely will you need an extension cord. it is long enough to make it around the car completely. The vacuum hose is also high quality and soft. And the hose coupling screws into the vacuum which is awesome. Its not just pressed on like the other shop vac's. High quality casters and the rear plastic accessory holder is perfect and fits everything you need plus extra. I can go on and on. Even if your not in the market for a new vacuum I would strongly consider replacing whatever you have with this. If you can find it on sale here at Autogeek then its a must buy. To be fair the only thing I would like to see in the future on this vacuum is caster locks. So that you can lock the wheels from rolling around while using it. The last thing you want to do is roll this sucker into the side of the car when you pull the hose towards you. I quickly resolved this by duck taping 2 out of 4 of the wheels to add some rolling resistance.